Legos are a wonderful toy for kids to develop their imagination while also working on fine motor skills. Plus, they're just plain a lot of fun. 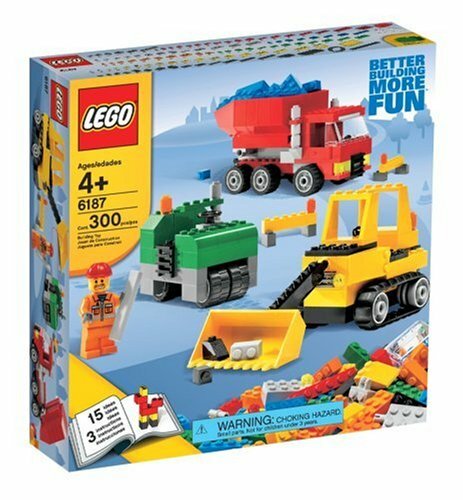 This set includes enough bricks to make three different construction vehicles - a bulldozer, a road grader and a dump truck - at once and still have a handful left over. When I saw the low price for this set, I was concerned that the vehicles were going to be tiny, but each is about the size of a softball (instead of a Hot Wheels) when assembled. The box itself is about 10"x10"x"3", so it's also nicely-sized for gifting. Every child is different, but our five-year-old had next to no problems with the parts in this set, i.e. while there is a good variety of brick sizes, but nothing overly complex. The instructions are typical Lego picture-based and lend themselves toward teaching kids the basics of following a plan, looking for visible patterns, and counting dimensions of Lego bricks. Of course, making the vehicles on the box is enjoyable, but the real fun begins when your child begins creating new ones right from his/her own mind. If your 4+ year-old enjoys building blocks, creative play, and/or especially construction vehicles, then this is a can't-miss. The only downside is that you'll probably soon find your child's room taken over by more and more Lego sets!